Please Note: The Zavio P5115 is No Longer Manufactured, please refer to the Zavio P5116 as a replacement. The Zavio P5115 is a 1.3 megapixel wireless pan tilt network camera with megapixel video resolution. The Zavio P5115 IP based pan and tilt camera is compatible with live remote viewing from both Windows and Mac computers. From Windows, the Internet Explorer web browser is used and from Macintosh computers, the Safari web browser is used. In addition to Internet Explorer and Safari, the Zavio P5115 also supports Mozilla Firefox web browsers. Mac users, please read this before purchasing. This camera also features 850nm infrared LED's with a range of 15 meters. It is fully motorized to offer wide range pan and tilt movements. Please note that this is NOT a PTZ (Pan-Tilt-Zoom) camera as it does not have a mechanical zoom functions. Pan and tilt function are supported, but NOT zoom. Click here to watch a remote camera viewing video demonstration using a Zavio megapixel camera (Zavio F3106) which has the same resolution as the P5115. This camera can be used as a hard wired IP camera using an Ethernet cable or configured to connect to a wireless access point using 802.11 b/g/n signals. 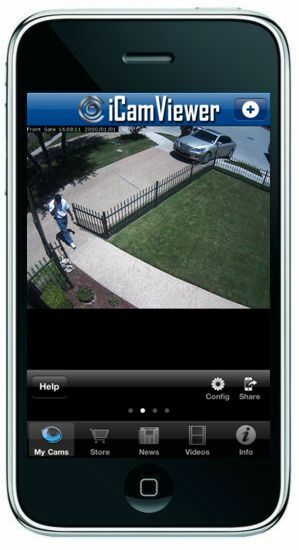 Remote iPhone and iPad access is supported using the Free iCamViewer app. Click here to watch a video of the iPhone app. This camera includes the following in the box: mounting bracket for desktop, wall or ceiling mount, power supply, software CD, and network cable. The Zavio P5115 supports live remote viewing over the Internet from a Mac computer, however, Zavio cameras can not record video directly to a Mac. For Macintosh users that are looking for a surveillance system that can also support recorded video playback from a Mac, we recommend using Zavio cameras with the NUUO NVR Titan recorder. It is highly recommended that Mac users read our Zavio IP camera FAQ for Mac before purchasing.